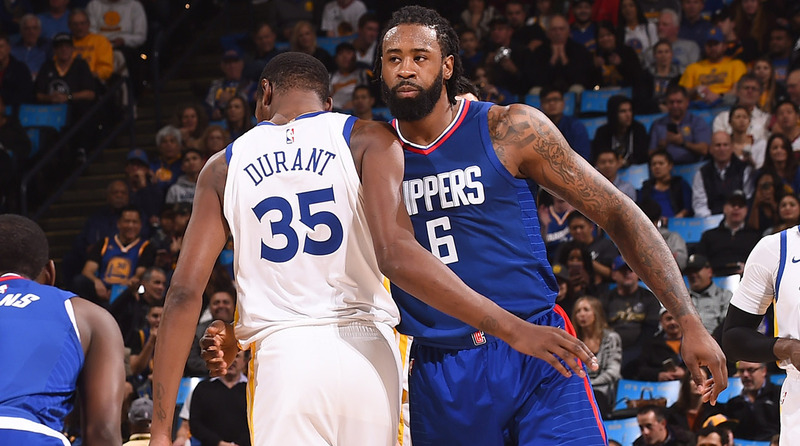 Should the Cavs target DeAndre Jordan? Or would they be better off looking somewhere else before the trade deadline? Andrew Sharp and Ben Golliver debate on the latest episode of Open Floor. The NBA trade deadline is less than three weeks away—and the Cavaliers are a complete mess after losing nine of their last 12 games. It's a perfect storm for rumor season. Will the Cavaliers make a move? Is there anything they can do to keep up with the Warriors? And will they be able to keep LeBron happy? Strap in to find out. In the latest episode of the Open Floor podcast, Andrew Sharp and Ben Golliver answer mailbag questions and examine the Cavaliers' outlook at the deadline. The two also discuss a potential trade that would improve the team's chances in the postseason. For even more on the Cavs' options, check out Jeremy Woo's deadline preview. Andrew Sharp: We got a lot of Cavs emails this week. We’ve hit another one of the points in the season where every article becomes: What’s wrong with the Cavs? What should the Cavs do? This one I really liked. Thaddeus says, “Everyone knows the Cavs will make a move. But the question is, will it matter? Will they shortsightedly sell the Brooklyn pick for DeAndre Jordan to keep Bron happy? Only to watch him bail this summer? I don’t know why DeAndre is the play if you’re trying to beat the Warriors. If Cleveland is looking for more two-way players to match up with Golden State, why not actually dangle the Brooklyn pick and offer it up to the Magic? What about for Aaron Gordon AND Evan Fournier?” What do you think, Ben? Ben Golliver: I think the Magic say no. I’m not trading Aaron Gordon if I’m them—at least not for that pick. The reason why you would look at DeAndre is you watched the tape from the last two games and you realized you have no interior defense when you play the Warriors. You can’t stop them. KD is parading to the foul line and creating wide-open looks for everybody. You have to make some sort of improvement tin the middle. In terms of paying a lot to get DeAndre, you now have to wonder about it from the Clippers’ standpoint too. They are on a nice little winning streak recently, they are playing with a lot of heart, and they’re not going to just pass him on for scraps like we thought was possible a couple of months ago. So, when I look around at their potential targets, whether it’s Cousins—I don’t love that fit—whether it’s DeAndre, a move would certainly help them get through the Eastern Conference. There’s no question about that. That’s one reason to make that move. I look at whoever else you might want to throw in there as potential trade targets, but for me it all comes back to how they screwed up the Paul George trade. And I think that ship has sailed. So from that standpoint, I’m kind of with Thaddeus in that I don’t see a move out there that can get them where they really need to go in the Finals this year. That move was available in June and his name was Paul George and they botched it. That’s on Dan Gilbert, that’s on his transition with the front office staff and that’s on everything else. But I don’t see a quick fix here or a magic fix. Sharp: I don’t see anyway they’d be able to get Aaron Gordon and Evan Fournier from Orlando, but man I would absolutely be calling the Magic daily about Aaron Gordon. Just because, who knows whether John Hammond is that committed to Gordon? And they’re going to have to pay him this summer. But if you’re Cleveland, Gordon could help you this spring and he’s a much better fit if you’re trying to beat the Warriors than DeAndre would be. He’s also sort of insurance for LeBron’s exit. IF LeBron leaves, they can still pay Aaron Gordon and have a young piece to build around. Things have been so weird in Orlando that it wouldn’t be crazy if they said, “Hey, let’s get a fresh start with a new group of guys. Let’s load up and get two top-10 picks and see what happens.” So it’s probably the best realistic Cavs solution that I’ve seen thus far, and I haven’t seen it mentioned anywhere else. Golliver: John Hammond: Don’t do it. Sharp: [Laughs] Yeah, maybe it’s not that realistic. I don’t know. But it seems better than a DeAndre Jordan pipe dream because I think given the success of the Clippers, they aren’t trading him for anything less than the Nets pick. And DeAndre’s not worth the Nets pick to me. Subscribe to the Open Floor podcast on iTunes for new episodes every week from Sharp and Golliver.